What sicknesses did medieval Europeans get? 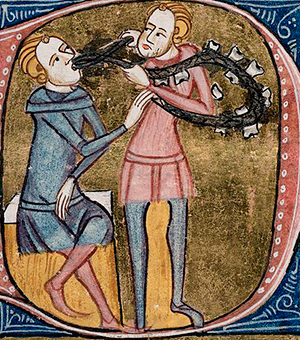 During the Middle Ages, most people were sick with something for most of their lives. Newborns were often born small because their mothers had not had enough to eat when they were pregnant. Babies caught dysentery and typhoid from drinking water with sewage mixed in it. About a quarter of all babies died before they were a year old. Children caught one cold virus after another. They also were infested with worms that made them tired all the time. Mosquito bites gave them malaria. 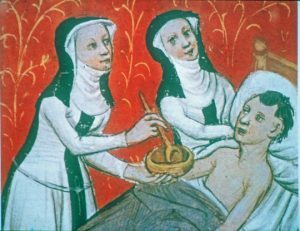 What treatments did medieval doctors use? Medieval doctors didn’t know of any treatments that worked for these sicknesses (we still can’t cure colds or prevent malaria). Doctors bled kids to reduce the fever, but that was worse than doing nothing. People tried praying to God and visiting Catholic healing shrines like Toulouse or Westminster Abbey. Kids also caught measles, mumps, rubella, and chickenpox. Most children recovered from these colds and illnesses on their own, especially if somebody took good care of them while they were sick. Smallpox killed more people. How did you get smallpox? By about 1150 AD, many doctors in Europe had read Ibn Sina’s medical encyclopedia, and knew that people caught measles and smallpox and tuberculosis from other people, so they began to try to quarantine sick people – to keep them away from other people for forty days (quarante, in French). They used quarantine to deal with the great bubonic plague – the Black Death – of the 1300s, too. Medieval doctors treated tuberculosis as the Romans had, with good food, rest, and clean air – but also by bleeding the patient. Like the Greeks and Romans, they gave people henbane seeds for toothache, and used aloe to cure burns, and mint tea for stomachaches. How did they treat infections? Children also had frequent eye infections and skin parasites like scabies. If kids got cuts or scratched itchy rashes, the cuts became infected, and sometimes kids died of the infection. Almost everybody had lice, and many people caught typhus from the lice. As people got older, frequent eye infections often led to trachoma, where your eyelids get so scarred that you go blind. Doctors sometimes successfully treated infections and skin diseases by pouring vinegar on them, but many doctors thought wrongly that if you got a lot of pus in your wound that would help it heal. They caught ergotism, a form of poisoning from eating infected bread. Because they didn’t get fresh fruits and vegetables or enough sunshine in the winter, they had vitamin deficiencies like scurvy and rickets and blindness. Some children suffered from epilepsy. Teenagers sometimes developed mental illnesses like schizophrenia, psychosis or depression. People often found some relief from mental illnesses at healing shrines. Many women died in their 20s either in childbirth or right afterwards, of infections they caught while giving birth. Birth control didn’t exist for most people. Some women became very depressed after having a baby. By the time people were in their 30s, they began to have a lot of trouble with cavities in their teeth and gum disease. People often died of an abcess (an infection) in a tooth. Many women (and some men) got breast cancer, and other types of cancer also killed people. People also complained about kidney stones and bladder stones. As Europe got richer by selling wool on the Silk Road, and more people sent their sons to universities, more medieval doctors started to do research and find out about diseases for themselves. In the 1000s, Trotula, a woman professor at the University of Salerno in Italy, wrote about women’s bodies. She realized that when women didn’t have children, it could be the man who was infertile and not always the woman, and she explained how to deliver a breech baby. In the 1200s AD the Italian doctor Theodoric Borgognoni wrote a book about surgery where he abandoned many old Greek and Islamic traditions and proposed new methods. Borgognoni said that encouraging pus in wounds was wrong, and instead insisted that doctors should clean wounds and sew them closed. He soaked bandages in wine to disinfect them. By 1287, after reading ibn al-Haytham‘s book on optics, Italian glassmakers made the first eyeglasses for farsighted people, and by the 1450s they could make lenses for nearsighted people too. Once people were in their 40s, they usually got sicker and sicker. From working so hard in the fields, men and women got arthritis in their joints. Often they would get weak enough to catch pneumonia and die. People who needed nursing care often moved to monasteries or convents, where Christian monks and nuns took care of them as in nursing homes today. Only a few people – and mostly rich people who had warm clothes and plenty of good food – lived to be as old as most people do now. Cite this page: Carr, K.E. 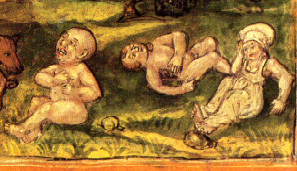 Medicine in Medieval Europe. Quatr.us Study Guides, August 4, 2017. Web. April 20, 2019.